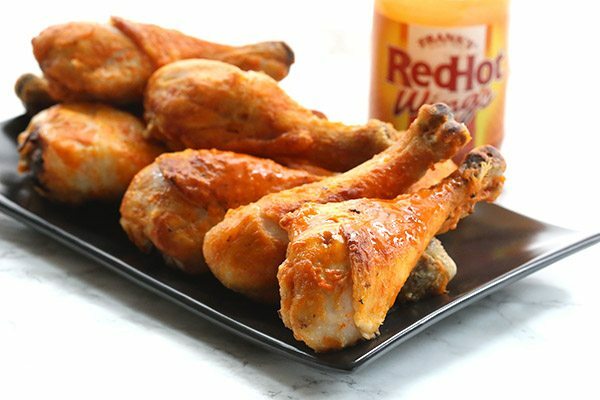 Baked buffalo chicken drumsticks that are truly crispy, without the hassle of deep-frying! Read on to discover the trick to making spicy oven-baked drumsticks with crispy skin, every time. This baked Buffalo chicken recipe is low carb, gluten free, and Paleo-friendly. I love deep fried foods. Who doesn’t, right? The way the outside gets all crisp and browned but the inside stays juicy and tender is nothing short of miraculous. And I don’t feel guilty eating these things anymore, as long as they are low carb, grain-free and fried in a healthier oil. (The list of “healthier” oils might surprise you…lard is great, soybean and canola, not so much. But I digress…). There really is no shame in deep-frying, as far as I am concerned. The only reason I don’t do it much myself is that it’s a helluva lot of work and wastes huge amounts of oil. And it makes your house smelled like fried food for at least a good 24 hours. Baking usually can’t hold a candle to frying when it comes to cooking chicken. Are you thinking there’s just no way to get that perfectly crispy-skinned chicken when baking? Well, until now, I would have agreed. I have discovered the secret and I am so excited about it, I have to share the recipe. It would be terribly unkind of me to let you go through your life thinking that the only way to get truly crispy chicken is in a deep fryer. 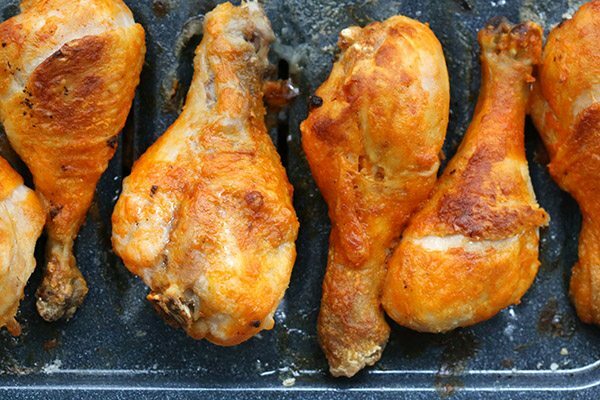 Once I tell you the secret ingredient, you will be astonished at how simple this oven baked Buffalo drumsticks recipe is to make. It’s quickly become one of my family’s favourite meals and I daresay it will become one of yours too! I’d love to tell you that this crispy baked drumsticks discovery was my own, but of course it was not. And chances are that some of you already know this little trick and are laughing that it took me so long to unearth it. But unearth it I did and I may never deep fry chicken again. Been there, done that and it’s just too much work. It was my beloved Pinterest that led me to the answer. I found this recipe for crispy baked wings on RecipeTin Eats, and I could hardly believe that a simple pantry staple was the trick. Yep, the secret ingredient is….baking powder. I know I am leaving many of you scratching your heads, wondering what shenanigans I am up to. Baking powder on chicken??? But it really works. If you want to crisp up that skin when oven baking, you need to try it. I am not entirely sure how it works, except that baking powder is mostly sodium bicarbonate, so it’s a salt, and it seems to have a drying effect on the skin of the chicken as it bakes. 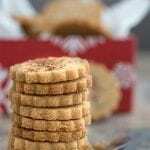 And this article on Serious Eats indicates that the alkaline quality of baking powder changes the pH of the chicken skin. It also changes to a gas during the baking process, that leaves a layer of tiny bubbles on the skin. You could get the same effect with baking soda, but I advise against trying it. It’s much saltier and much stronger in flavor, so your chicken will taste simply of baking soda and not much more. I test drove the method on some chicken wings first, and it worked perfectly. And it occurred to me it would work well on drumsticks too. 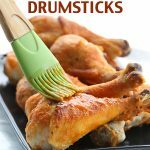 My kids adore drumsticks (or “chicken on the bone”, as they like to call them), and they provide an easy and inexpensive meal for my hungry family. You can really use any sauce you want here. Just cook the drummies with their coating of baking powder, salt and pepper and then finish with your favourite sauce or glaze. Low carb barbecue sauce, or try Kalyn’s sugar-free teriyaki sauce. Simple, easy and seriously crispy. This method for Crispy Baked Chicken works every time. Want truly crispy baked buffalo chicken without the hassle of deep-frying? Read on to discover the trick for crispy skin every time. Paleo and low carb. 2 tbsp baking powder not baking soda! Preheat oven to 250F and set a wire cooling rack over a large baking sheet (line the sheet with tinfoil for easier clean up). Spray rack with cooking oil (I like Kelapo coconut oil spray). Pat drumsticks dry and place in a large ziploc bag. Add baking powder, salt and pepper and shake vigorously to coat. Lay drumsticks in a single layer on prepared rack and place rack in the lower third of the oven. Bake 30 minutes, then increase temperature to 425F and move tray to upper middle rack of oven. Bake another 30 to 40 minutes, until well browned and crisp. In a small bowl, combine melted butter and buffalo sauce. 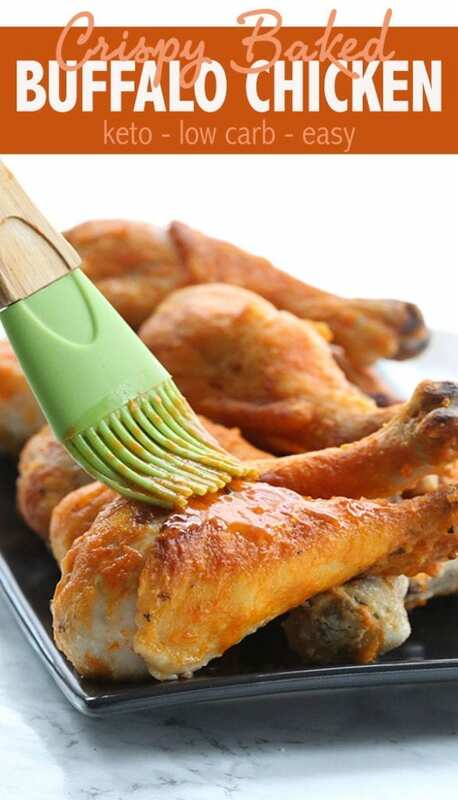 Brush over drumsticks or toss them in a bowl to coat. At this point, you can return them to the oven for another 5 to 10 minutes, if you like the sauce to be baked on. I eat chicken almost everyday and drumsticks are my favorite part… Since I “intermittent fast”, on any giving day I can knock back 10 -15 pieces of chicken and a pound of broccoli and still look for more… I’m a huge fan of buffalo chicken but I can’t stand them when they’re soggy…lol… I will give these a go tonight with baking soda and report back… Great idea… Thanks always! Wow, baking powder?? Who would ever think that … thanks for sharing your discovery! Will definitely try it out next time when I make wings/drumsticks. I’ve used this recipe numerous times on chicken wings and drumsticks. Awesome and crispy chicken everytime. Definitely don’t use baking soda. In baking you may be able to substitute. For this…absolutely not. I ended up tossing all of the chicken as it was inedible. Yay! So glad it worked for you and you like them. Clearly you like them! Did you follow the recipe exactly or did you change anything about it? I’m making them in a bit and I’m not sure how they’re gonna turn out :/ any advice? Not baking soda, baking powder. Big difference, lol. Good luck, I’m making them as well !!!! I never knew this! What a great tip! I love chicken and have it at least four times a week and I’m always looking for interesting ways to prepare it and this one sounds great – to be able to make the skin crispy!! I enjoy lemon-pepper seasoning, without sugar of course, and usually just sprinkle it on my chicken and then bake it. Do you think this would work if I put the lemon-pepper into the baking powder bag? Or would it be better to wait and sprinkle after the butter? Thanks for your many, many interesting recipes and doing the hard work for us!! Keep on keeping on! Yes, I think adding the lemon pepper into the bag would work fine. I found this trick on another site just last week and tried it and they were fabulous!! I live in a town in Upstate New York where every establishment sells wings (some great, some not so) and these oven baked ones are as good or better than any I’ve eaten anywhere! The other blogger noted that the tip was from Cooks Illustrated, and they know their stuff! Only problem is that your serving size is 2 pieces-but who can eat only 2!?!?!? You’re free to eat more if you like. they are pretty low carb! These look so good! I’m wondering if other cuts of chicken, like thighs, would work in this recipe. Would one just bake them longer at the 250 degree stage to ensure they are thoroughly cooked through? Yes it works on other pieces of chicken. I used it for thighs the other night. Truly amazing and crispy! Yum! Are these really HOT? If so, any suggestions on toning them down – I so want to give them a try! I’ve given up baking powder because of the cornstarch in it. Do you think cornstarch is the magic ingredient, or would my homemade baking powder (baking soda + cream of tartar) work? I found a recipe for baked sweet potato fries and it says to sprinkle them with cornstarch to keep them from getting soggy, so maybe it is the cornstarch. It’s primarily the sodium, actually, which draws moisture out of the skin. Otherwise, we’d just be dousing them in cornstarch! 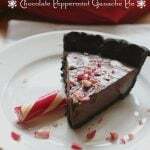 This recipe looks great & I look forward to eating delicious! I can almost see my boys fighting over the last piece of this chicken. It looks amazing. So so so so good! Best wings I have ever made! Hubby agreed! Thank you! 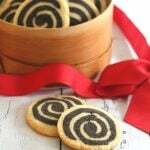 Going to make these tonight but will be using just small chicken drummetts. Would I still cook them just as long for these little things? Don’t want to over cook and make them try and tough. Thanks much!! Ooooooh! Haha, I saw your second comment first and thought you were saying that my recipe should be called “dry and tough”. I was a little surprised by that. Okay, this makes more sense. Yes, cook them less but they actually stand up to quite a bit of cooking. Try 20 to 25 minutes for the second stage. Well, I made them, adding the lemon-pepper to the dry ingredients but I must have done something wrong. They turned out waaaay too salty and did not crisp up. I cooked them for 30 minutes for the second stage and they were done. I even used low sodium baking powder. Followed directions. Maybe adding salt when using lemon pepper wasn’t wise, as the first ingredient in it is salt. I will try again bcause I want to experience crispy baked chicken. Just reporting back. 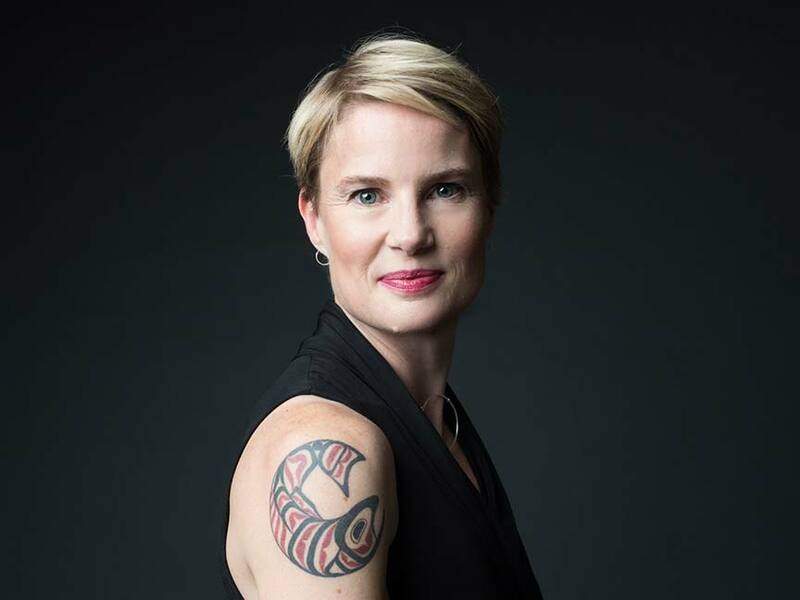 Thanks again, Carolyn. You know what I think the problem is? The low sodium baking powder. You need regular. The skin gets crispy because the sodium bicarbonate draws moisture out of the skin during baking. Now, I have a very high tolerance for salt, but if you are very sensitive to saltiness, this may not quite be the recipe for you. But if you want another go, try regular baking powder and then leave out any additional salt. Does your lemon pepper also contain salt? Yup, first ingredient in the lemon pepper is salt. I definitely will try again using regular baking powder and omit any other salt since the lemon pepper has plenty. 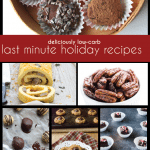 I really want this to work cause they look sooooo good and others have had success making them and I’m a healthy low carb junkie!! Thanks again! Okay, give that a go and let me know! I am grateful for reading through comments because our family has changed over to low sodium baking powder and this problem would not have occurred to me on my own. Since we normally don’t use the regular, it will be probably be somewhat wasted but that’s ok since it’s not too expensive. By the way, family loved this. One member is afraid of too spicy and it pleased even that person as not simply “hot” but good flavor. We are fairly new to cooking our own wings/drumsticks instead of getting from a restaurant so this is very helpful. I was afraid they’d be too hot so used “Guy’s Award Winning BBQ sauce” it’s sugar free and pretty good! make that “dry” and tough, please. Second time was much better. Used regular baking powder and lemon pepper seasoning and did not add any other salt. Do you turn the legs over half way through the baking or not? Thought they might turn out just a little more crispy than they were. The bottom side was a bit soggy and the top almost crispy. I was very happy because the salt balance was just right. Will be making these again. Thanks!! Did you use a baking rack for them? If you put them on a regular roasting pan, the bottom does get soggy. But if you put them on a metal cooling rack, the sort you put cookies on after baking, enough heat gets to the bottoms that you don’t have to turn them. Sure did. Just wondering if turning them halfway throught the cooking process might help. Did you turn yours? No, I didn’t turn mine at all. The bottom got crisp because there was enough air flowing in on my very open cooling rack. I tried these as well (on the rack) and the bottoms were soggy. I turned mine too because I wanted the whole thing to be crispy. 🙁 I foiled the baking pan before placing the rack on top (for easy clean up). Carolyn, is your oven gas or electric? Do you think that matters? I have gas and the heat comes from the bottom unless I’m broiling and then there’s an element at the top. The flavor was great, but I think for the time invested and the smokiness of the house, I’d just rather fry outside and be done with it! My oven is gas and I have no issues with the bottoms getting soggy, nor do I have issues with my oven being smoky. The splattering is concerning, these bake slowly so there should be minimal splatter. I really don’t know why yours would do that! I made these and they tasted like baking soda. It is one of the ingredients in my baking powder. I want to like these but needed sauce to cover up the taste. Thank you!, just thank you! i’ve tried the tineats wings and was just doing a search to see if it worked with bigger pieces of chicken such as thighs and drumsticks. So this post was perfect! thanks. 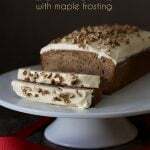 Fabulous recipe! I bought chicken thighs to use in your Chicken Adobo recipe. But I saw the Crispy Baked Buffalo Drumsticks in your top posts side bar and decided to try it on a whim. I am so glad I did. The skin was crispy and delicious; the meat was juicy and tender. I served it with a salad topped with blue cheese crumbles and Blue Cheese dressing. Fabulous meal! My husband just walked in the room and said I really like that chicken! I still really love your Chicken Adobo but will have it another day. Thanks for another great recipe. Cook’s note: I baked the chicken 10 minutes with the buffalo sauce on it. Since thighs seem to be thicker than drumsticks I thought they might need the full 10 minutes. The thighs came out cooked to perfection. Just wanted to add 1 more cook’s note: I forgot to spray the rack before putting the thighs on it. After baking the Buffalo Chicken thighs and putting them on the serving plate I put the rack in the sink with hot soapy water. The rack wiped clean with no scrubbing. The tin foil on the tray made clean up easy too. – – So if you don’t have oil spray on hand or forget it, all is not lost if cooking thighs. They generate plenty of “non-sticky” oil for the rack as they cook. Thanks! I’ve done this with thighs to get the crispy skin on those. So good! First: I was nervous at the initial low 250° cooking temp. Second: I was concerned there would be an after taste from the baking powder. 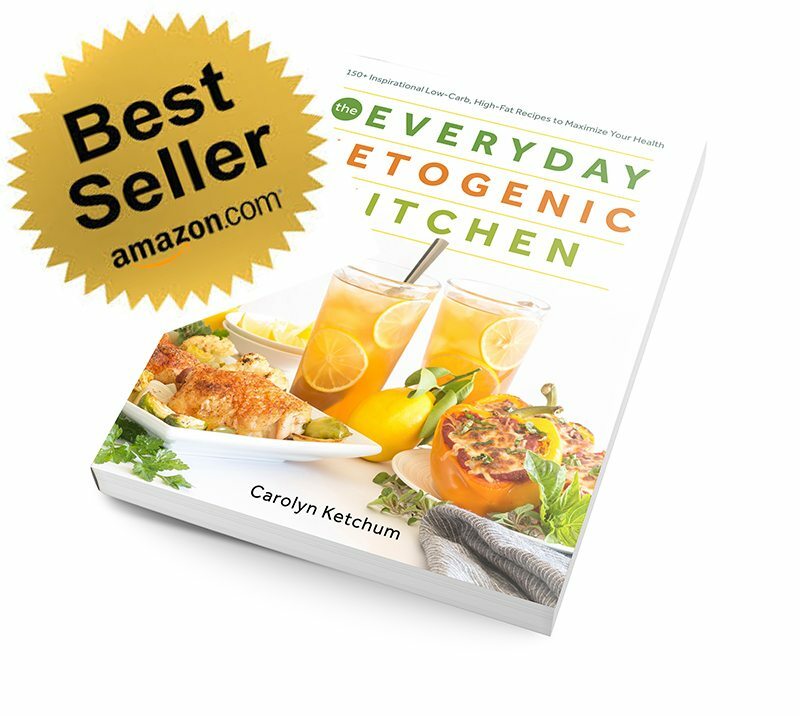 BOTH of my concerns were wiped away with the first bite, Delicious, Juicy, Fully Cooked and Easy chicken recipe. I also have a Three-nager (my very picky eater) and a toddler, they both grabbed a drumstick and chowed into them! I had just over 4 pounds of chicken (14 drums,) followed the cooking directions until it came to sauce them, I used a Teriyaki and BBQ sauce, and then broiled them on low for a few minutes. I may be making this weekly, THANK YOU!!! I commented earlier but my computer crashed so I’m sorry if this is a duplicate. I made this recipe tonight and LOVE it! I took the skin off half the legs because I’m really watching calories and they came out great! I left the skin on the other half for my husband and they came out great as well, of course! I used Frank’s buffalo sauce and the heat level was perfect! Will keep this in the rotation! It’s not a recipe. It’s Frank’s Buffalo Sauce. I live in France so no hope of buying it! Any clues as to what he uses pls? Google Franks Hot Sauce, I am pretty sure the ingredient list will be on the bottle. As to the amounts, I honestly have no idea. 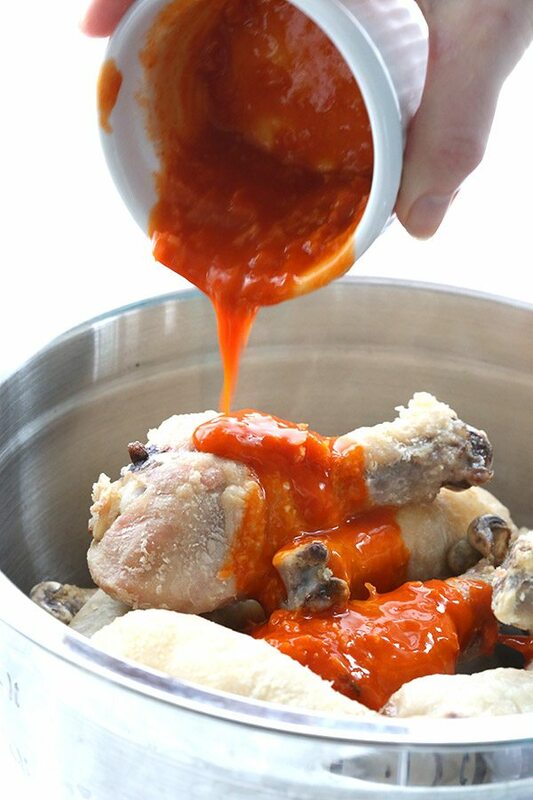 Or try goggling “Homemade Buffalo Sauce”…I bet you will find some good home versions! ok will have a look. 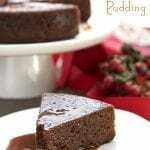 I served it up last night with mango chutney but we could taste the baking powder. not too keen on that! You do need a sauce here to cover the baking powder flavour. We made our own sauce because we always have the regular hot sauce at home anyway. 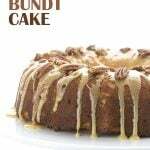 Very easy to find recipe and easy to make! This recipe is AMAZING! We just finished enjoying this crispy delight! The only thing is that I might use unsalted butter next time… I used Louisiana hot sauce…Delicious!!! Crispy!!! 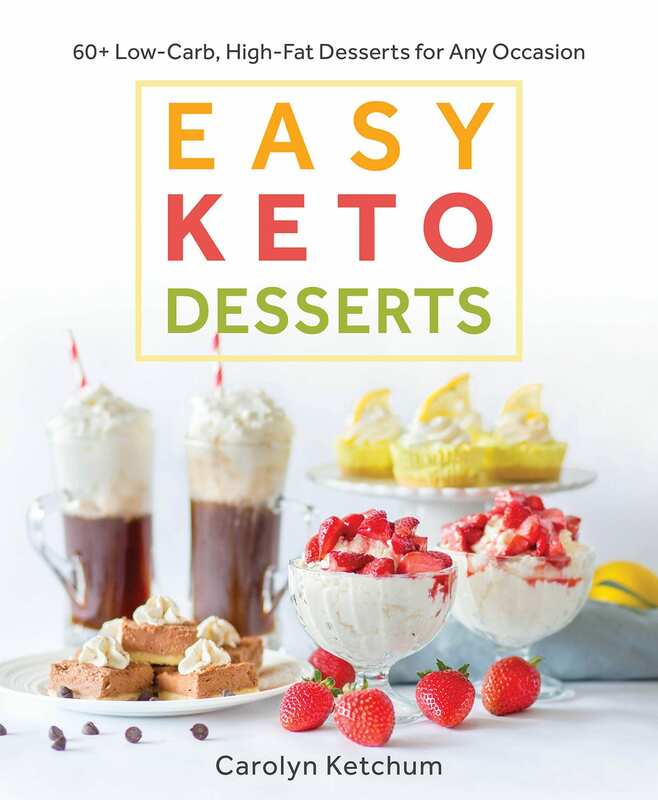 We are newbies to the KETO lifestyle…3 weeks in…This recipe has made the top 10 list for sure. The Baking Powder is BRILLIANT!!!! These looks amazing! Anything crispy/buffalo is A+ in my books! I’m going to try these this weekend! One question: If I remove the skin, will I need to alter the recipe in any way? If you remove the skin, I am doubtful that they will get crispy. I removed the skin and followed the directions exactly and they came out great!!! So eager to try this! Thank you! 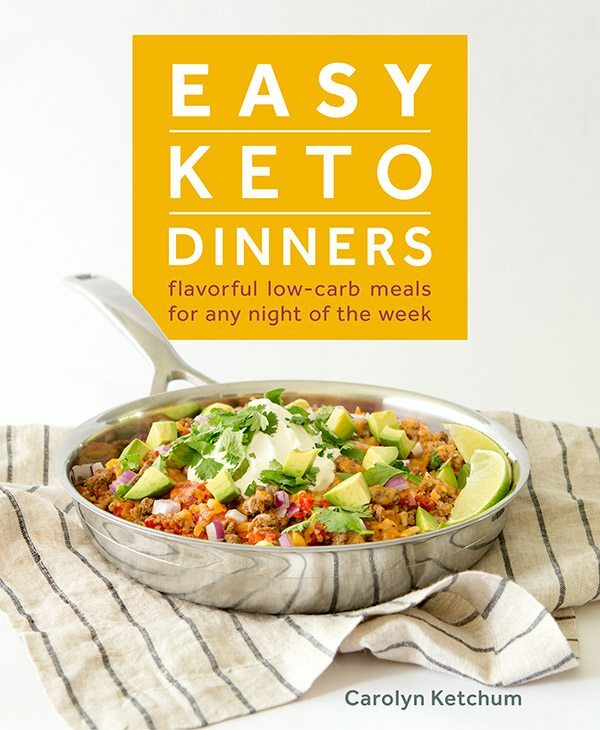 I just started Keto two weeks ago, and I love this recipe. I’ve made it twice already. I don’t cook them in the oven, though, I cook them in my pellet smoker. I’m able to treat it the same as the oven procedure, but with a nice smoky flavor added to it. OMG!!! These are the best wings! Seriously, these are amazing! I had seen a video from a big time chef that used baking powder in the past, but I hadn’t tried it until tonight. People…do yourselves a favor and make these! I only have thighs. How long do you think you’d cook thighs for the same crispiness? Made these tonight OMG they are amazing!! I made drumsticks for the kids and wings for me (ran out of drumsticks!). So good I dare say the best I’ve ever had and all done from home so much cheaper than buying them out! I loved it so much! Thanks! 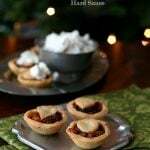 I made these tonight and just had to tell you how good they were! My husband and I both loved them! I had never heard of the baking powder tip and I was amazed by how crispy the skin got! Thanks so much for the great recipes! I don’t have a baking sheet, would a pan work? Such as one that you would use for a cake? I have a clear and a darker one! It would work, but you just need to make sure it’s big enough to set your rack over it. I made these for dinner tonight and OH.MY.GOODNESS! So unbelievable good! I followed the recipe exactly as written. I did throw the drumsticks back in the oven for a couple of minutes after adding the sauce. They were absolutely amazing and family approved! My husband & I love this we have even tried it without the buffalo sauce & it makes a great baked/almost fried chicken. We have even used barbeque sauce & it is great. 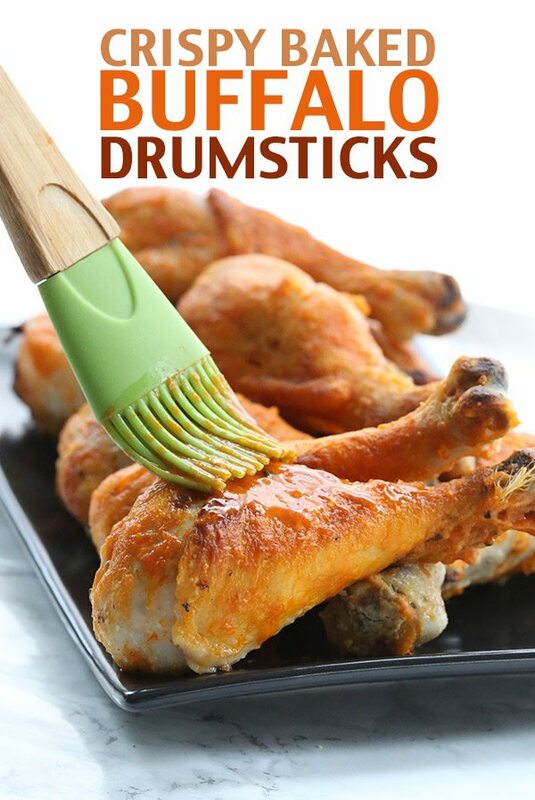 Thanks for sharing this great way to cook drumsticks! These are delicious! I am one of those that the chicken was soggy on the bottom and my oven got smoky from grease splattering everywhere. But I will flip them next time and lower my oven temp a little as it must run a little hotter. Interestingly, the last time I made these, it happened to me as well. I’ve made them 8 or 10 times and this was the only time it’s happened. I am going to try to pinpoint what the issue is. They are still delicious though and I am making them again tonight, I loved them that much. Thank you! And I need to get an oven thermometer so I can see how hot my oven is running. I made these this weekend with thighs are they’re fantastic! Sooo crispy! A nice new recipe in my chicken thigh rotation. Always looking for different ways to make chicken. My husband prefers it skinless. Would this work without skin? Showing my ignorance, is Buffalo sauce just bought at the store or do you make your own? Purchased buffalo sauce. And I think some readers have made it skinless? Check the comments, you might find some info. Do I start with the chicken drummies fully thawed or frozen? 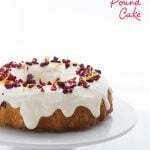 Looking to try this recipe soon and want to get it right! Thawed and patted very dry. I am originally from upstate NY (aka Buffalo, NY- home of the first chicken wings) and am admittedly a bit of a chicken wing snob, so I was skeptical. Baking powder? Really? 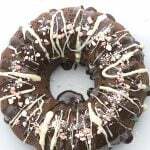 Well,i made them last night for New Years Eve and they were a hit! I’ll be making them again! Oh yay, glad you liked them! Absolutely delicious, made it twice using different sauces! Do you boil your chicken drumsticks or put them ram i to the oven the picture looks like the chicken might have been cooked. I tried these and I must say omit the salt. I couldn’t tell if the salty taste was coming from the baking powder or the salt. Otherwise they came out good and crispy! Timing is way off on these. I followed instructions exactly. They’re in the oven now and they’re weirdly coated with baking powder and not done. I have an oven thermometer and it is exactly 425. Drumsticks are 135 degrees per my digital thermometer after 40 minutes. Ugh, this is the last time I follow a Pinterest recipe from a page I know nothing about. Ps. I was a rep,for Tyson Chicken for 20 years! I know chicken! Hi Patti. I think you can see from the overwhelmingly positive feedback that this recipe is indeed a good one. Perhaps it’s your digital thermometer that is off. I’ve made them about 6 times myself. Please, if you want help rescuing a recipe, I am here for you. But if you just want to tell me how awful I am, don’t bother. I am an excellent cook, and I too know chicken. Anyone who knows anything about chicken knows that it would be WELL cooked at 40 minutes in a 425F oven. Most of these commenters have not made the recipe. I did. It did NOT brown to crispy and golden, even AFTER using convection for the last 10 minutes of the 55 minutes on 425. It was semi-dry powdery white in spots and just not at all appealing in texture or taste. The added salt draws out moisture, btw. Anyone who knows,chicken knows that. The first 30 minutes at 250 does not thing more than soften the meat and fat. Your third photo on here actually does show what they looked like, and that is nothing like the others. If you don’t want criticism and only praise, remove the feature like you did my comment. But adding an “Anyone who knows anything” comment shows who you are. 20 years as a trainer in Pennsylvania, Delaware and New Jersey for Tyson Chicken, I taught supermarket employees in A&P and Superfresh how to properly prepare rotisserie, fried and baked chicken. But if it makes you feel better to insult, go right ahead. You’ll remove,this comment anyway. You too have a good day. 🙂 I didn’t remove your comment, it’s right here for all to see, along with the 1 star rating. I simply think there are more productive ways to leave feedback for people. I also did not insult you in any way, shape or form. For the record, I am not into false advertising. The photos you see here are indeed the exact photos of this recipe. There is no misrepresentation, and the 3rd photo simply shows them before the sauce is fully on. Yes, they are pale. But they are also incredibly crispy at that point and my family loves them. I never leave comments on anything, but I think its necessary to leave a comment. 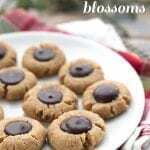 This is by far the best recipe I have ever found on Pinterest. I did not have a wire rack but I covered a pyrex with tin foil and cut slits in it and it still turned out perfect! Healthy and delicious, thanks. Was the tinfoil pulled taunt over the pyrex, and it was hollow between the tinfoil and pyrex container? Then you place the drumsticks ontop of the taunt tinfoil? I don’t have a wire rack, and I’m trying to figure out how to make this work! Yup, exactly what you said. It was hollow in between and the juice drained into the pan. I had to use a couple pieces on tin foil so it was strong enough to hold. I made this in February and then again they are in the oven for tonight’s dinner by Hubby’s request. Great recipe! Don’t be put off by the pale appearance when they are done! Simply brush with your favorite sauce after cooking and the skin is nice and crisp. I am going to do some with buffalo sauce and some with BBQ sauce tonight. Even peanut satay sauce would be great. If you are trying to cut carbs and breading this is a great solution. My guess is that even a little butter brushed on with herbs at the end would be delicious. Can you substitute baking powder? This is already made with baking powder. And no, baking soda doesn’t work. Curious as to the reason for the first cooking period of 30 minutes at 250 F? It’s a very low setting and the drumsticks don’t cook much at that temperature. I’m trying these out tonight, thanks for the recipe! Renders the fat and makes the skin more crispy. This is one of our favorite ways to enjoy chicken! Love that crispy skin! My boys will love this! Nothing better than getting that fried crunch from baking. What a great tip for getting these crispy without deep frying! They look delicious! I assume these can be made in the air fryer as well? If sonhas anyone tried it and what settings/time? I love the crispy exterior, so much better than fried! I’m pinning these for sure! Excellent! Crispy skin and tender, juicy meat…we’ll use this recipe regularly. Thanks, Carolyn! What a wonderfully simple recipe! Moist and crispy. I added 1 T of nutritional yeast to the salt, pepper, baking powder mixture. Ate them w/o sauce and thought they were great. Will definitely make again. I love that the chicken is crispy but I don’t have the mess of frying! Perfect! These are great! Super easy to make for week night dinners! Thank you for making my husband’s day — he loved this! My husband loved this! Thank you so much or the tips! Tasty but very SALTY! Not for the salt-sensitive or someone with hypertension. 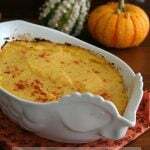 We Love Love Love this recipe although my husband is not on Ketogenic diet however he is as well looking very much forward for when I prepare this recipe 🙂 It is so easy, simple to prepare and comes out delicious everytime! A staple in my weekly cooking . Thank you so much !